Living bivalves — Xenostrobus pulex (little black mussel) New Zealand. Bivalves have inhabited the Earth for over 500 million years. They first appeared in the Mid Cambrian, about 300 million years before the dinosaurs. They flourished in the Mesozoic and Cenozoic eras, and they abound in modern seas and oceans; their shells litter beaches across the globe. Some occur in lakes and rivers. Fossil bivalves were formed when the sediment in which they were buried hardened into rock. Many closely resemble living forms which helps us to understand how they must have lived. Anatomy of a bivalve shell. Volviceramus involutus (J C Sowerby, 1828) has two very differently shaped valves. Laevitrigonia gibbosa (J Sowerby, 1819) has valves that are mirror images. Bivalves, which belong to the Phylum Mollusca and class Bivalvia, have two hard, usually bowl-shaped, shells (called valves) enclosing the soft body. The valves are the parts usually found as fossils, but decay of the elastic hinge tissue that joins them means that they are rarely preserved together. The valves consist of layers of crystals of the mineral calcite or aragonite. Particular strengths conferred by different crystal layer arrangements help bivalves adapt to a variety of environments. A hinge, formed by the interlocking of rows of projecting nodes (teeth) and notches (sockets) along one of the inside edges of each valve, guide the opening and closing of the valves. In life, bivalve shells are made from layers of crystals of the minerals calcite or aragonite, which are the two different mineral forms of calcium carbonate (CaCO3). Fossil bivalves were formed when the sediment in which they were buried hardened into rock. Many closely resemble living forms, which helps us to understand how they must have lived. Bivalve shells may be elongate, round or highly irregular in shape. The valves are often mirror images, e.g. Laevitrigonia, but each can have a different shape, e.g. Volviceramus. Patterns of concentric and/or radial ribbing add strength and provide anchorage in sediment. Nodose (knobbly) ornaments may prevent shells being dislodged by water currents, while spines defend against predators or offer support on soft sediments. All forms have fine concentric lines marking shell growth. The most important functions of fossil bivalve shells were to protect against predators and prevent dehydration in intertidal environments. The inside surface of a bivalve shell is marked by the attachment areas of the muscles and ligament responsible for opening and closing the valves. These features, with the teeth and sockets of the hinge, are important for classification. As with living animals, fossil bivalves are classified into species and genera whose scientific names are Latin words or words that have been Latinised. The full scientific name of a particular bivalve comprises the name of the species, preceded by the name of the genus to which it belongs, and followed by the name of the first person to describe it, and the date of that description. Bivalves are vulnerable to attack from gastropods, crustaceans, starfish, fish and birds. Large, thick shells and spines protected some, while others hid themselves by burrowing into the sea bed using an extendable muscular 'foot'. Insoluble layers in some bivalve shells resisted the chemical attack of shell-boring gastropods. Most bivalves lived by filtering water-borne food particles, although some extracted nutrient directly from the sediment. In the Mesozoic Era, the evolution of extendable tubes of soft tissue (siphons) enabled bivalves to burrow more deeply whilst keeping their food supply accessible. A special embayment of the inner shell margin (pallial sinus) allowed storage of the siphons when danger threatened. Reconstructed life position of Gryphaea arcuata (Lamarck, 1801) Jurassic. Different modes of life are reflected by the shape of the bivalve shell. Streamlined burrowing forms contrast with the irregular form of oysters, e.g. Deltoideum that reflect the irregular surfaces they encrust. The bowl-shaped Gryphaea is adapted to soft, fine-grained sediment, while Teredo and Penitella used their abrasive shell ornaments to bore respectively into wood and soft rocks. The rapid flapping of the fan-like shells of fossil scallops, e.g. Pecten, propelled themslves through the water to escape predators or to find new food. Bivalves can be used to show if the rocks in which they occur were formed in a marine, brackish or freshwater environment. Abundant fossil oysters might suggest deposition in shallow water, or proximity to ancient shorelines. Sometimes bivalves are a useful guide to the age of the rocks in which they occur. This is the case in the coal-bearing rocks of the Late Carboniferous in which Carbonicola has been used to identify and correlate individual coal seams. The strata of the Late Cretaceous Chalk Group, forming the famous White Cliffs of Dover, are rich in the remains of inoceramid bivalves. They have been used to refine the established Chalk biostratigraphy, and so aid correlation. The genera Mytiloides, Cremnoceramus and Cladoceramus are markers respectively for the base of the Turonian, Coniacian and Santonian (Cretaceous) stages and species of Mytiloides and Inoceramus define biozones in southern and northern England respectively. The strong influence of environmental factors on bivalve distribution coupled with rather slow rates of evolution limits their widespread use for biostratigraphy. Even in the rather uniform environment of the Chalk, some groups display faunal provincialism. Bivalves can be readily found in the Jurassic, Cretaceous and younger sedimentary rocks, especially along the coast of the UK. Pterotrigonia scabricola (Lycett, 1875) Cretaceous. Pinna calnensis (Arkell, 1935) Jurassic. Shell bed with Carbonicola robusta (J C Sowerby, 1840) Carboniferous. Examples of bivalves through time. The old Scunthorpe Coat of Arms (Courtesy of the North Lincolnshire Council). The strongly recurved form of some Gryphaea is popularly known as the Devil's toenail. Some 17th and 18th century Scottish accounts show that its possession was believed to cure arthritis. In the Scunthorpe coat of arms, images of this oyster signify its occurrence in the formerly commercially important Jurassic ironstone deposits of the area. Fossil bivalves can also resemble parts of 'four-footed beasts'. Robert Plot (1640–1696) illustrated internal moulds of Jurassic specimens of Myophorella and Protocardia as horse's heads and bull's hearts respectively. His illustrations are shown on the left of the originals. Horse's head (drawing by Robert Plot). Myophorella (Courtesy of the National Museum of Wales, Department of Geology). Bull's heart (drawing by Robert Plot). Protocardia (Courtesy of the National Museum of Wales, Department of Geology). Reconstruction of a Late Cretaceous rudist bivalve colony. In the Late Cretaceous, bivalves with strangely-shaped conical right valves up to 50 centimetres high, formed coral-like reefs across southern Europe and north Africa; known as rudist bivalves, they became extinct at the end of the Cretaceous Period. Giant clam (Tridacna gigas), Phuket, Thailand. 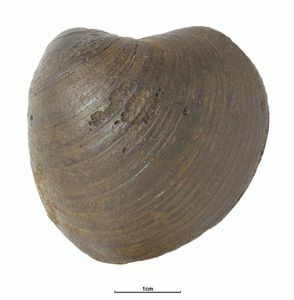 Modern freshwater bivalves can become dormant for up to six months when the pools they inhabit dry up; some may live for 100 years. A much greater age is alleged for the modern giant clam (Tridacna gigas, Lamarck, 1819) which can weigh up to 90 kilogrammes and, like some Upper Cretaceous specimens of Inoceramus, may measure over a metre across. Sometimes sand grains or parasites irritate the fleshy shell-lining of bivalve shells, and a pearl is formed. One of the largest of these pearls weighed about 300 kg. Load 3D model Cyprina sedgwickii (SM B 19578 – Holotype). Click to load 3D fossil model.